- Pumpkin lace vase by Maya*Made, very goth! - Tentacle pot pie by Megan at Not Martha, creepy! 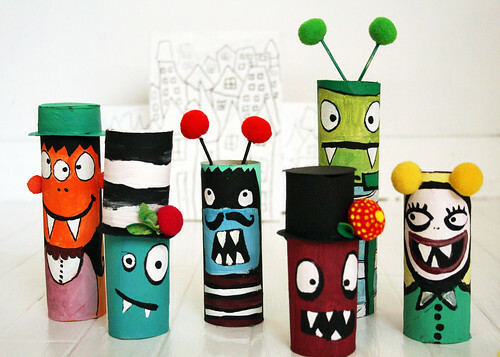 We've been doing Halloween arts and crafts with friends and getting ready for the big day on Sunday. Ben has two great homemade costumes, courtesy of his Yaya (firefighter and leopard), but he is stubbornly asserting that he will be a ghost on Halloween... 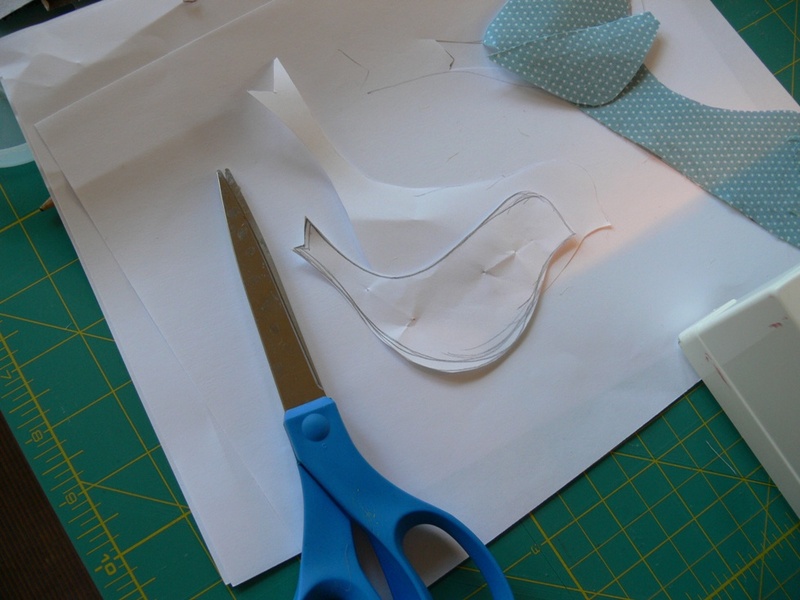 So it seems like I might have to dig up some old white sheets and go to town with the scissors... Any ghost costume tutorials you can send my way? It's done! 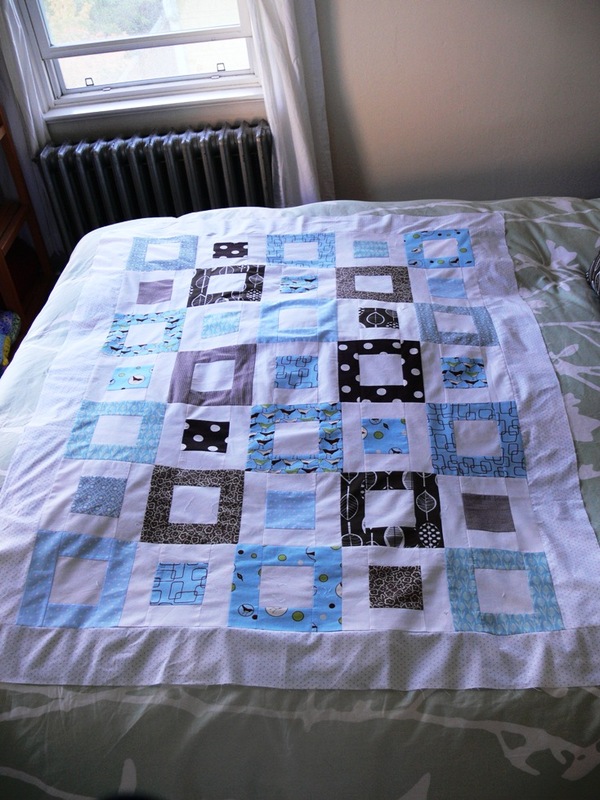 My Scrappy Squares Quilt is FINALLY done! 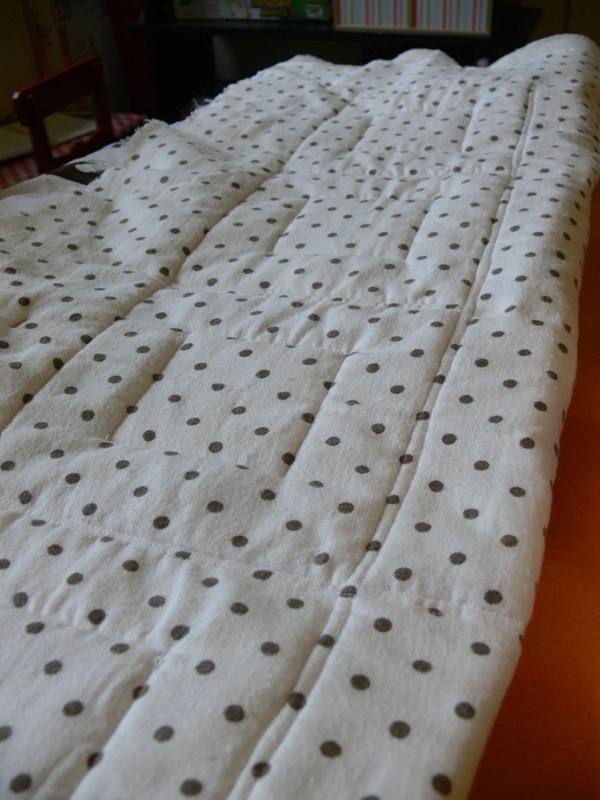 When I last posted about it, I had found a nice flannel for the back, assembled my layers and begun quilting. 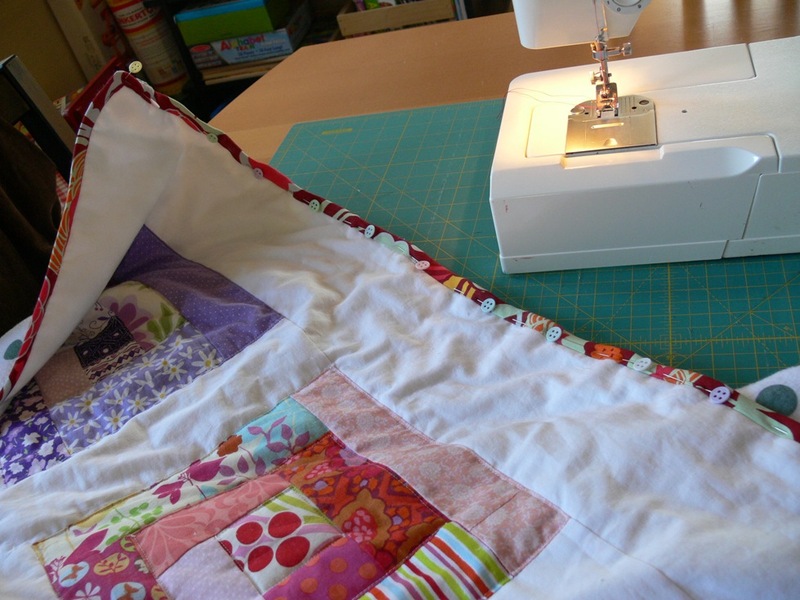 The quilting process took quite some time: the quilt was big and bulky, hard to maneuver around my basic sewing machine. 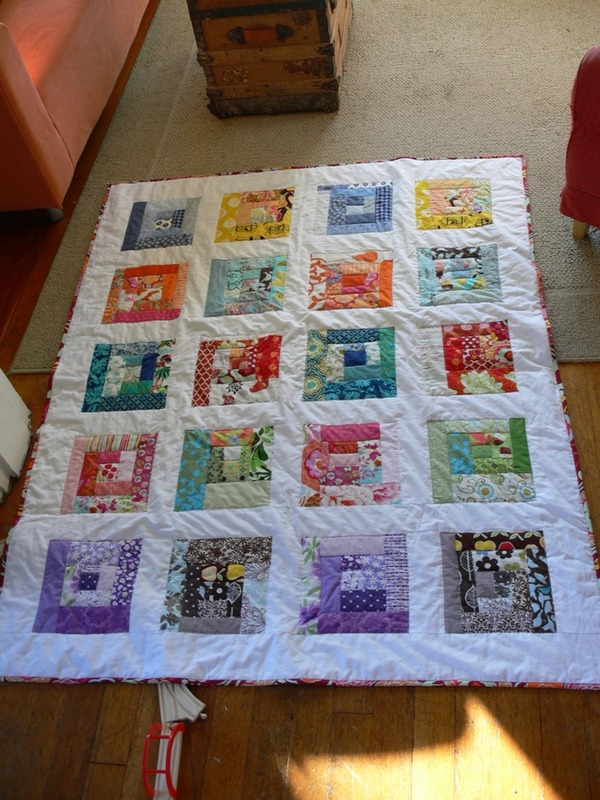 I also didn't make it easy on myself, choosing to quilt 3 squares for each block (1 square on the inside of each block's layer). 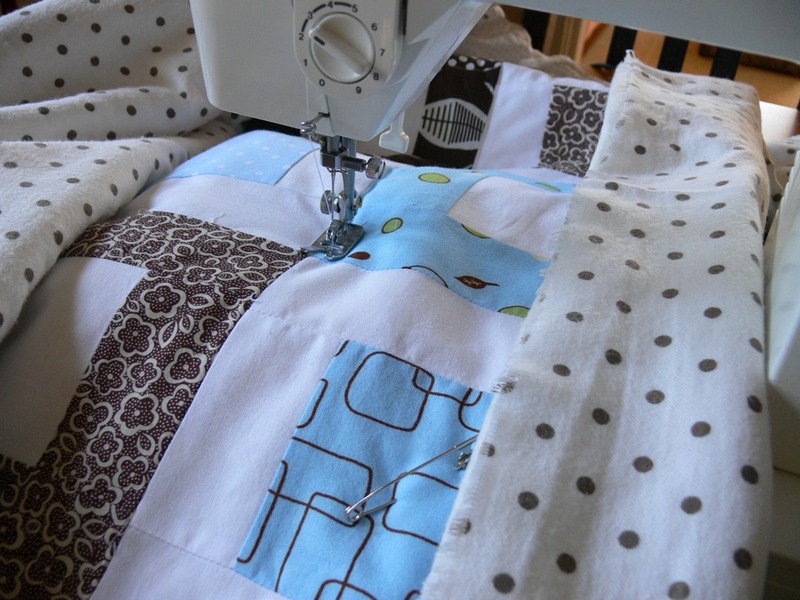 In order to fit the quilt through my machine, that meant I had to stitch 2 L-shapes per square, then tie the threads together at the corners on the front and back of the quilt. (Does that make sense?) Bottom line: it was time consuming. There is a lot of puckering and it is by no means perfect, but it is DONE! 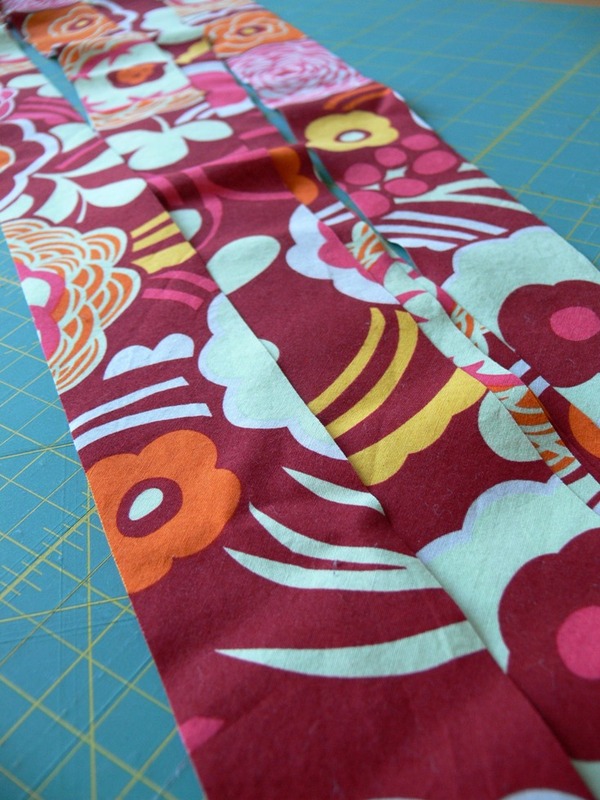 The next step was to make some bias tape. I had a couple of yards of Alexander Henry's Mocca in red. 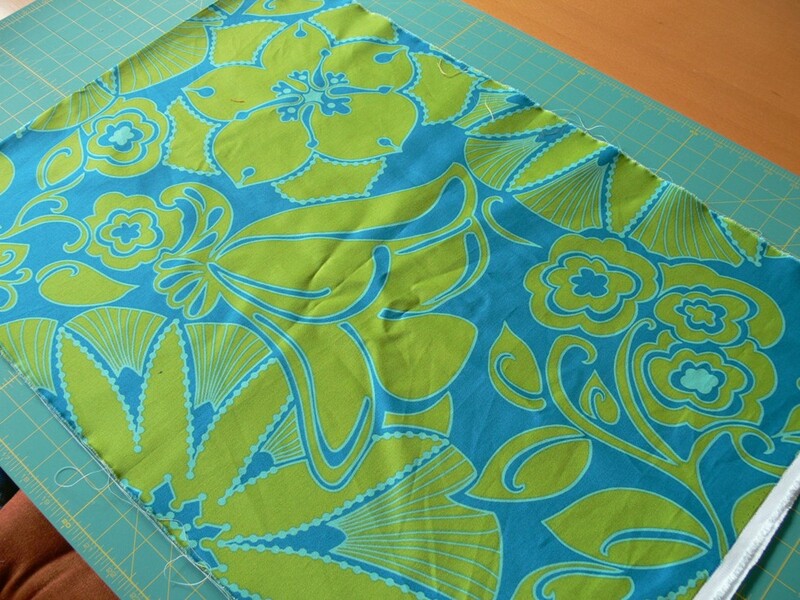 I love that fabric but it is so bold that I didn't know if I would ever be able to use it in a large project. 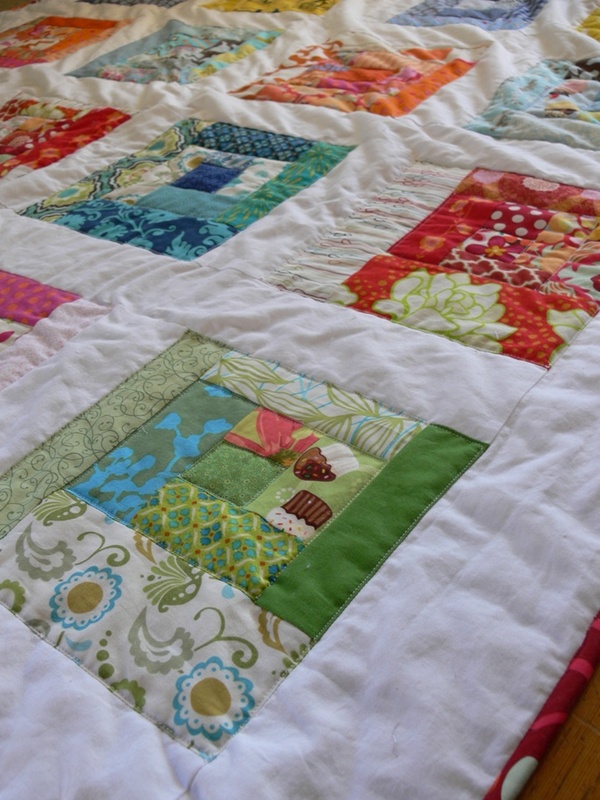 Since it includes so many colors that are in the quilt's scrappy blocks, I decided to use it for the binding. 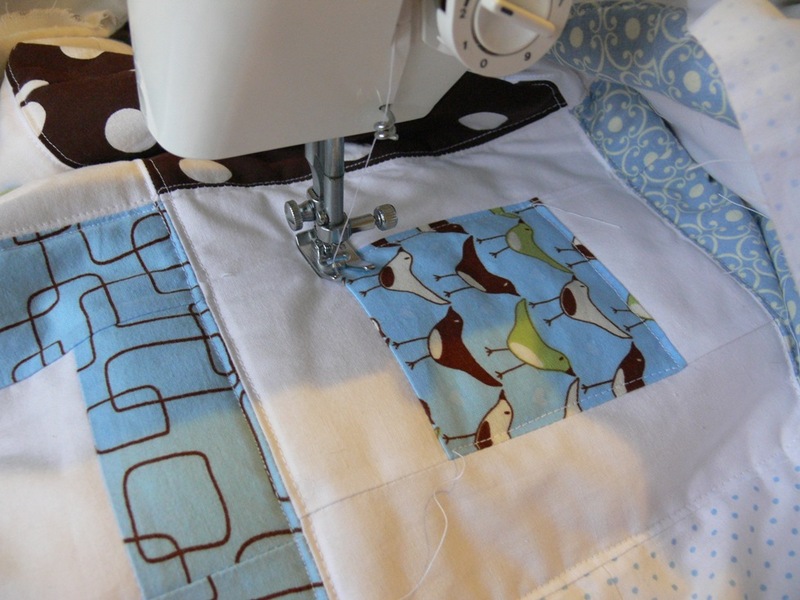 I followed a tip I saw on Cluck Cluck Sew a while back and zigzag-stitched the edges of the quilt. 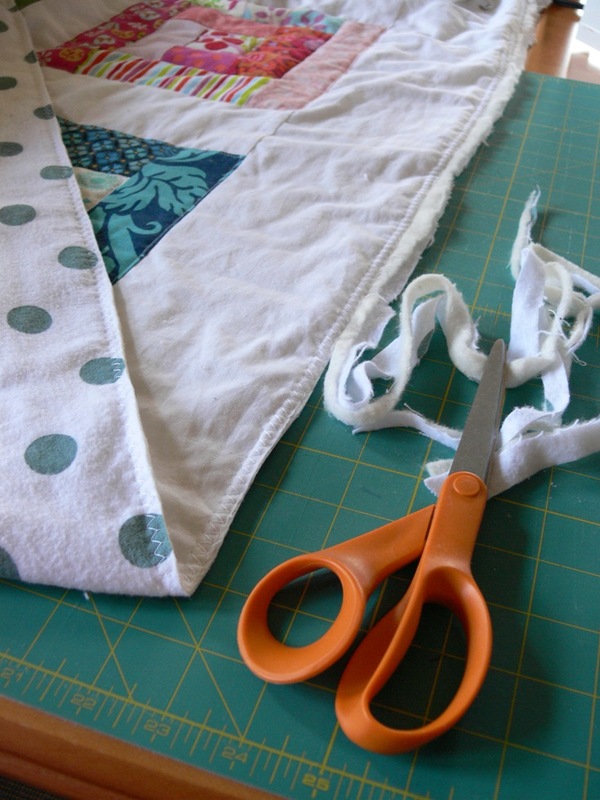 This secured all my layers together and made attaching the binding way easier. 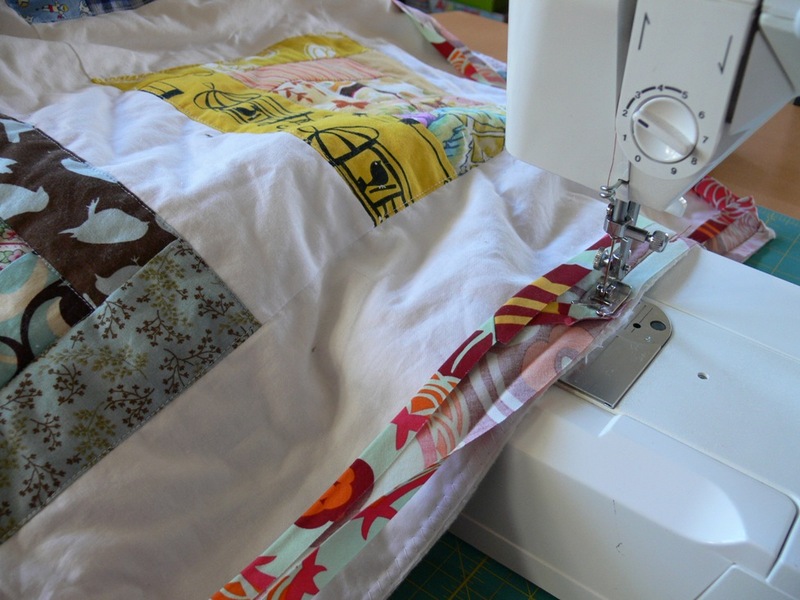 As I mentioned in my post about the baby quilt, I also figured out a better way to pin the binding in order to properly stitch in the ditch. It worked much better this time around. Here are some more detailed shots. This project has been in the works long enough, it deserves some gratuitous attention! 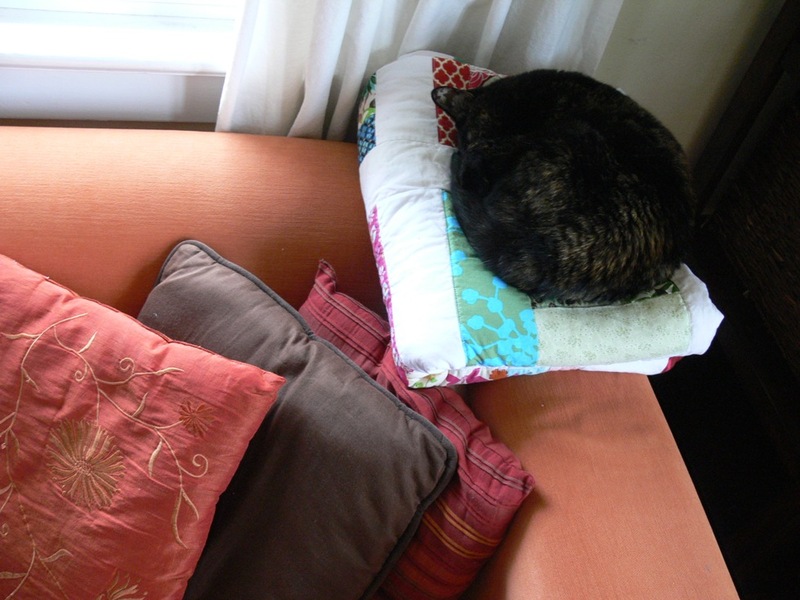 I'm happy to report the quilt has gotten a lot of use already. I routinely find Cali taking her nap on it. I've snuggled under it for TV-watching and knitting in our brisk fall evenings. And Ben includes it almost every day in his tent-, fort- and boat-building games in the living room. He also used it as a "dance floor" to give us a dancing, singing and juggling performance the other day, he he. 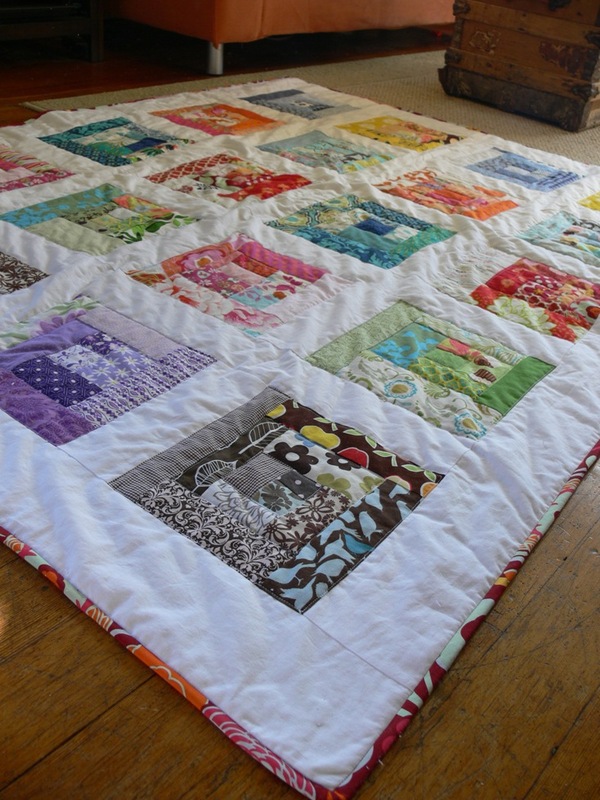 I am so happy to finally have this quilt as part of our regularly used family items! Jenny, it is wonderful! 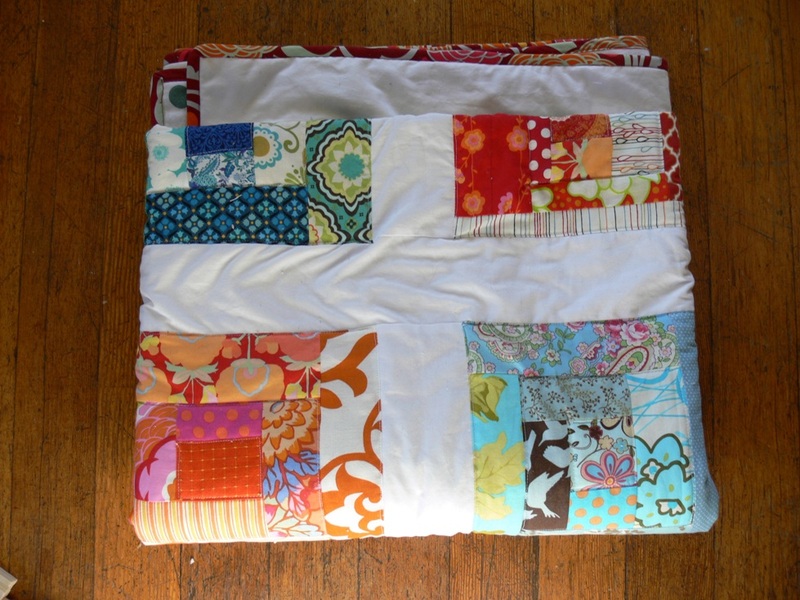 I am so inspired to start a quilt of my own now! Do you think it's best to start with a small one? Thank you to everyone who participated in our little "Guess The Project" contest this weekend. 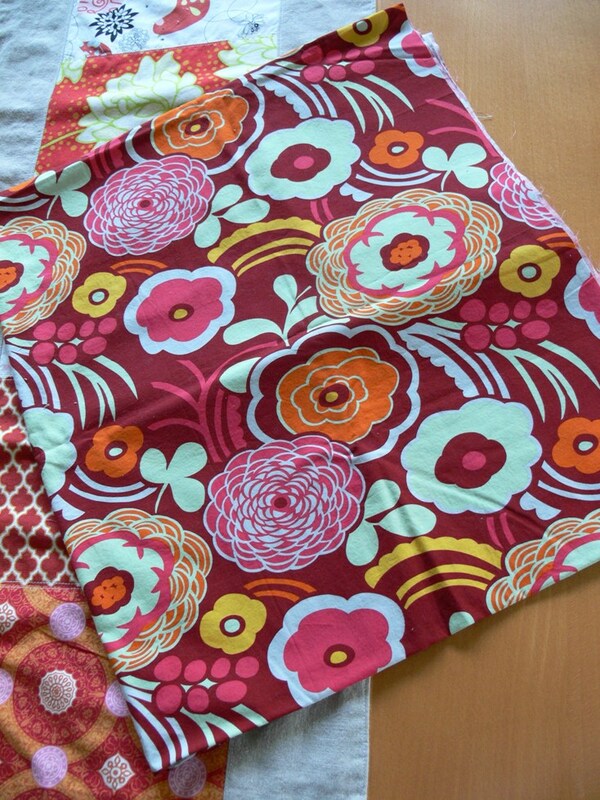 As many of you guessed, I am going to be making a swanky diaper bag! 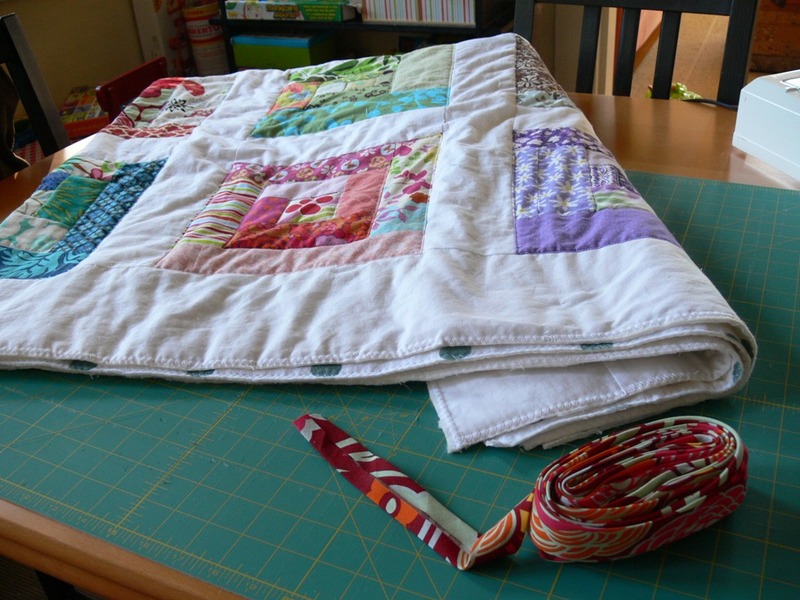 The first reader who correctly guessed the specific project is Joanna, The Hungry Crafter. Congrats, Joanna! 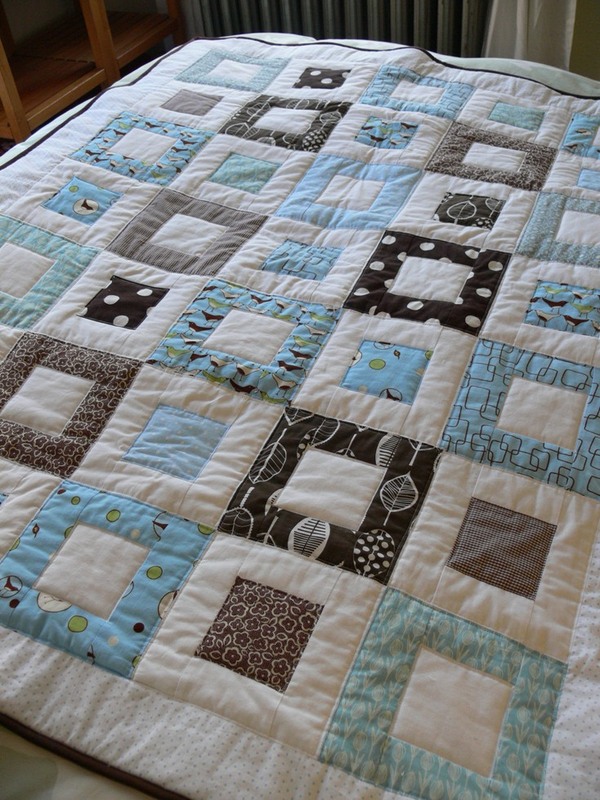 You are the winner of the FQ of Shadow in Teal from Anna Maria Horner's Drawing Room collection. Congratulations, Erin (ScottFM)! 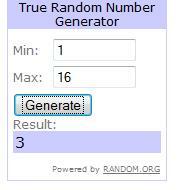 You've won yourself three lovely pieces of fabric! I'll be emailing the winners shortly to coordinate the fabric delivery. Thank you all for participating! We are planning on having a few more giveaways before the holiday season is up, so stay tuned! For updates, you can "like" us on Facebook and/or follow up on Twitter if you don't already! It's been a while since we've done a giveaway, so I thought it might be fun to play a little game and give away some designer fabric! 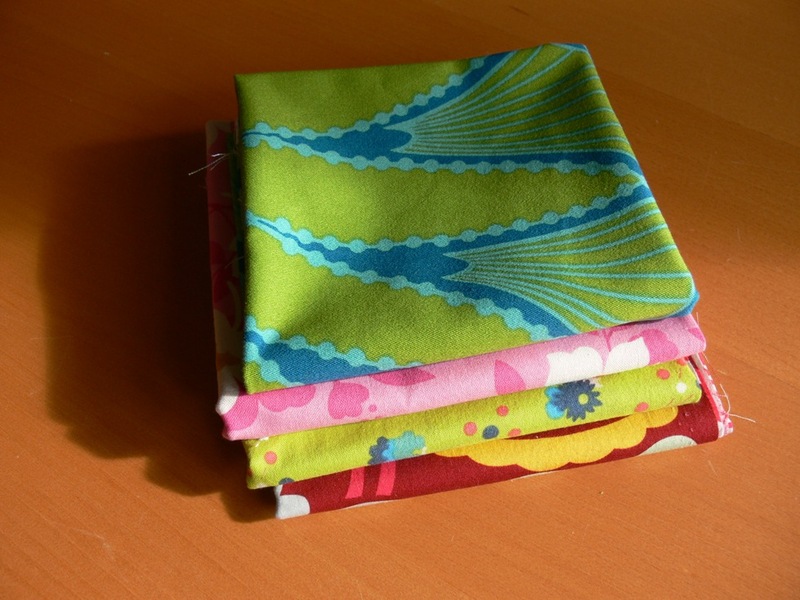 I have gushed about my love for Anna Maria Horner's Drawing Room fabric collection. I had a little bit left after making my clutch and zippered pouch, and bought an additional yard of it for a new project. Can you guess what that new project is? 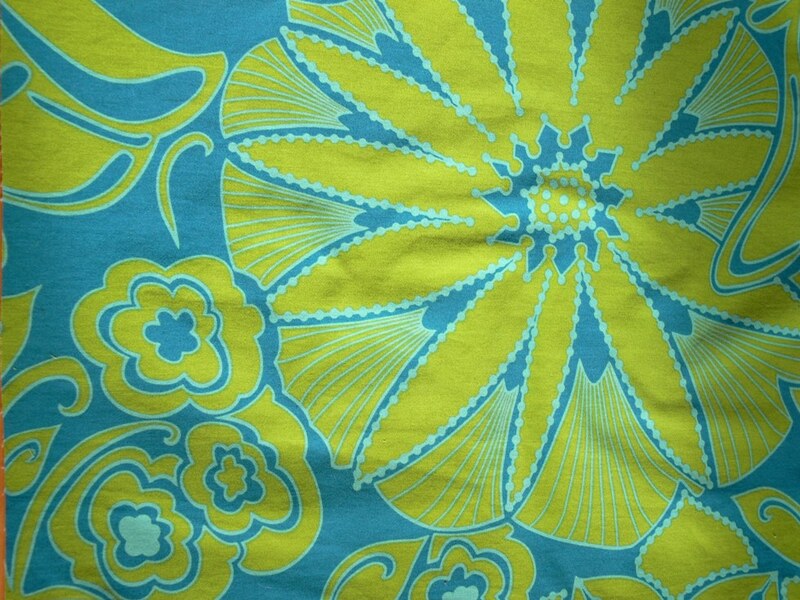 Here are the clues: first, the fabric itself and second, assorted notions that will be involved in the project. What am I going to be making with this stuff?! Give us your best guess in the comments. One entry and one guess per person, please. Make sure your comment includes a way to reach you, like an email address or link to blog. This little contest is open until Sunday 10/24 at midnight PST. Here's the best part: there will be 2 winners! 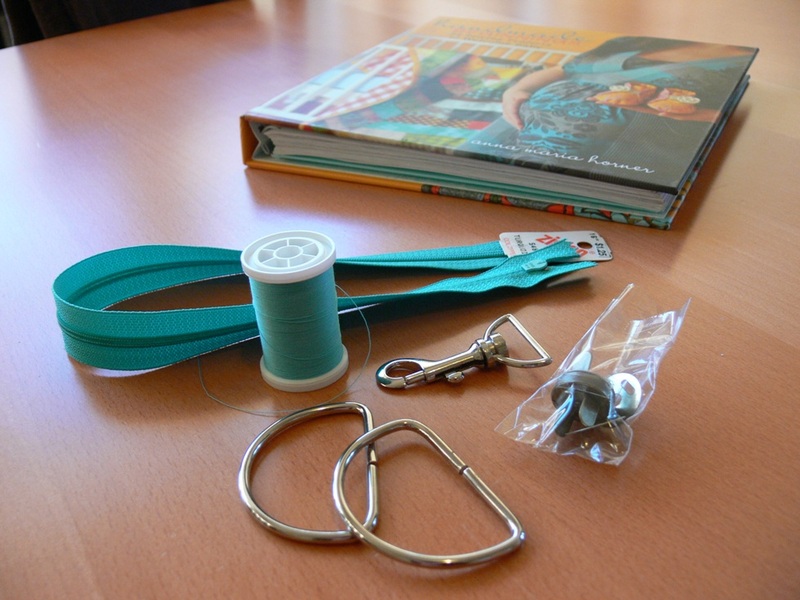 First person to guess the project correctly wins a fat quarter of the above mentioned Shadow in Teal by Anna Maria Horner (home decor weight). And just for playing along, we will also pick a random winner from all answers. 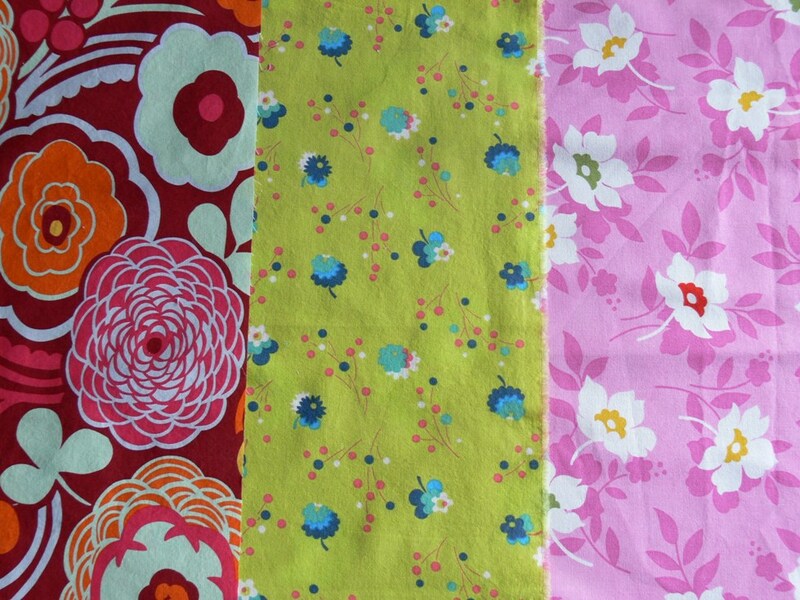 Their winning bundle will include the following fat quarters (quilting weight cotton): Mocca in red by Alexander Henry, a lovely green FQ from Denyse Schmidt's Flea Market Fancy collection, and Swing Toss in pink from Heather Bailey's Nicey Jane collection. Winners will be announced on Monday 10/25. 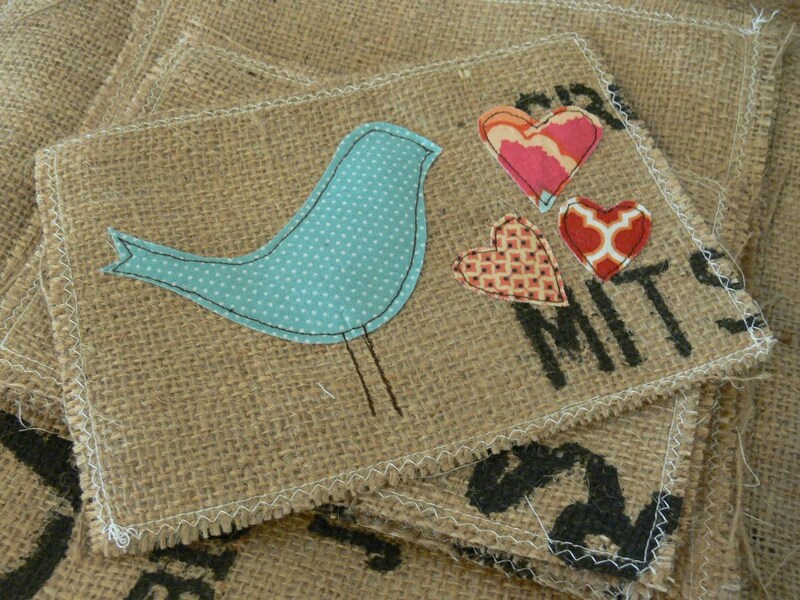 If there are no correct answers, we'll pick one random winner from all comments who will receive all 4 fat quarters. All fabrics have been pre-washed and ironed, so they are ready to go for whatever cute gift projects you've got planned for the holiday season! Hi Angel, I hope things are settling down a bit for you after a household full of sick boys, a little one who won't nap and a computer that won't cooperate! Things have been busy over here. I seem to have officially entered that last stretch of pregnancy which for me, means wanting to feverishly complete (ahem, start) every project under the moon. So yeah, I've been busy! Less than 5 weeks left till the little one makes his arrival -- assuming he is somewhat on schedule, unlike his big brother. On and off this past month, I've been working on putting together ideas and visions for my Etsy shop. 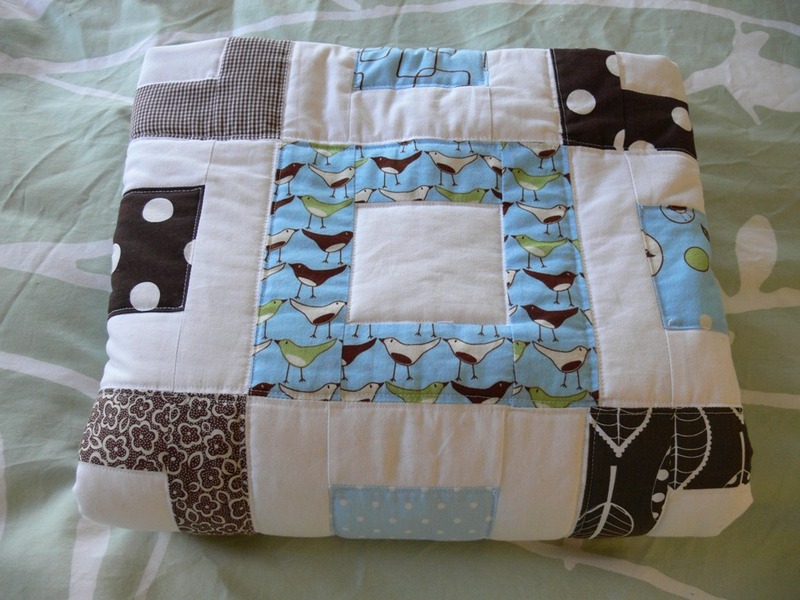 I thought I would give you a glimpse of the type of stuff I'm thinking of making and selling. 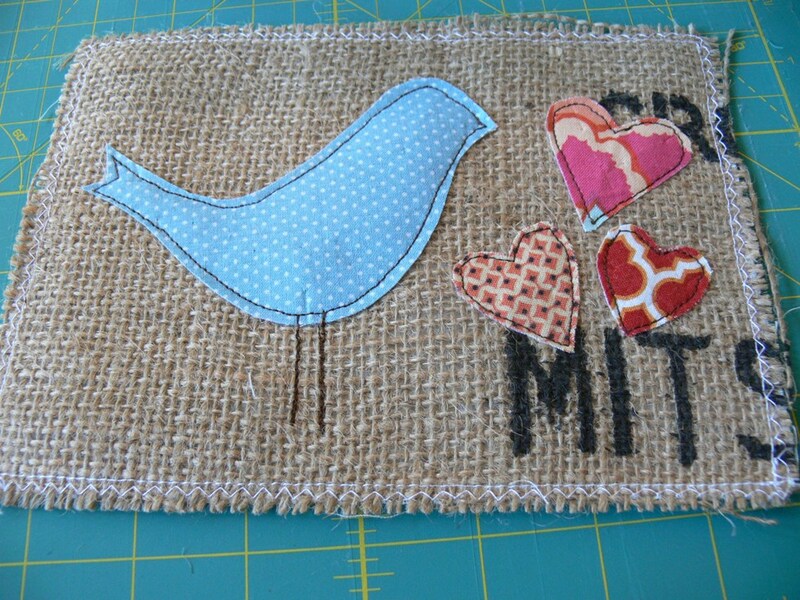 I actually made a piece of burlap art yesterday, for one of my good friends here in Seattle. She's the first friend I made here after we moved and has an adorable son who is Ben's age. Just yesterday, she completed a 6-week treatment of chemotherapy and radiation. Her attitude throughout this process -- and since I've known her -- has been incredible and inspiring. Needless to say, she has been on my mind a ton and I wanted to make her a little something to celebrate the end of her treatment. 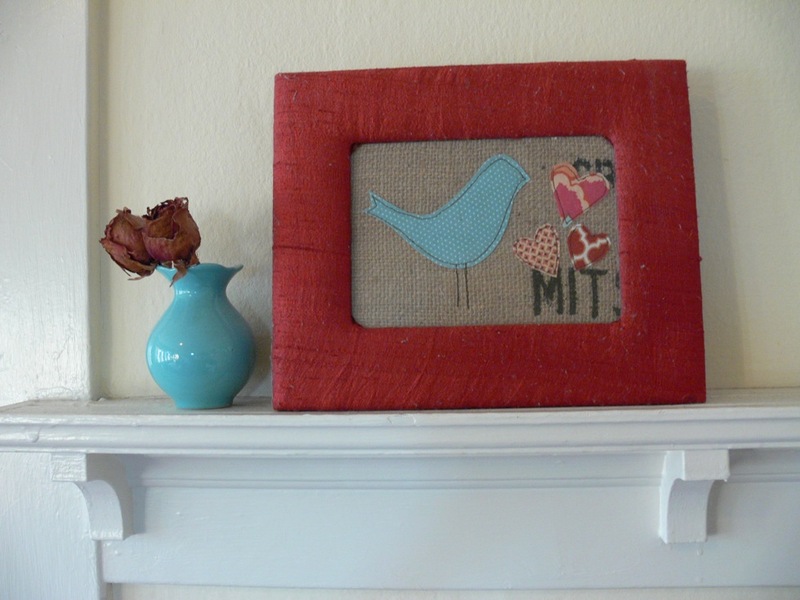 Last time she was over at my house, she spent some time checking out the burlap art hanging over my bed and made some really nice comments about it. I thought this might be a good direction for a little gift. I wanted to make something small-ish, that she could either frame or pin on a bulletin board somewhere. 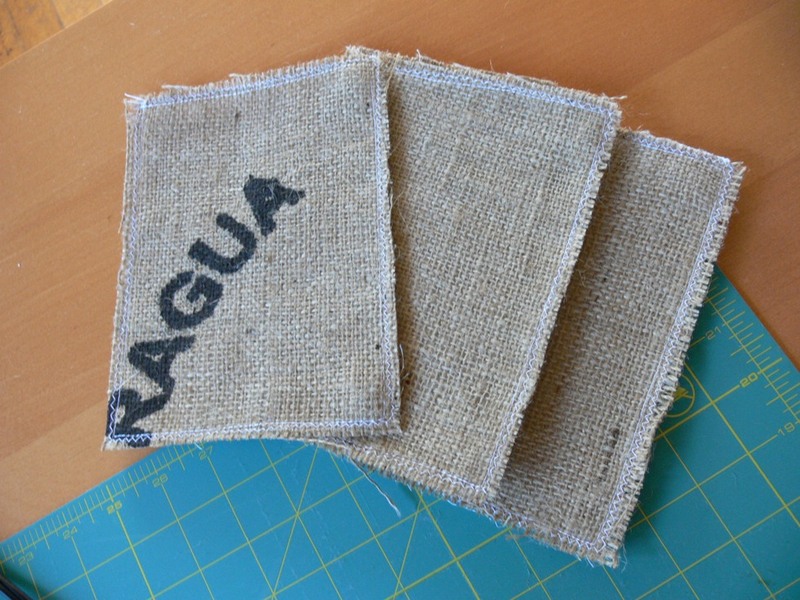 Part of the work I've done toward the Etsy shop is to cut burlap coffee sacks into various sizes, and to then sew them onto muslin fabric. 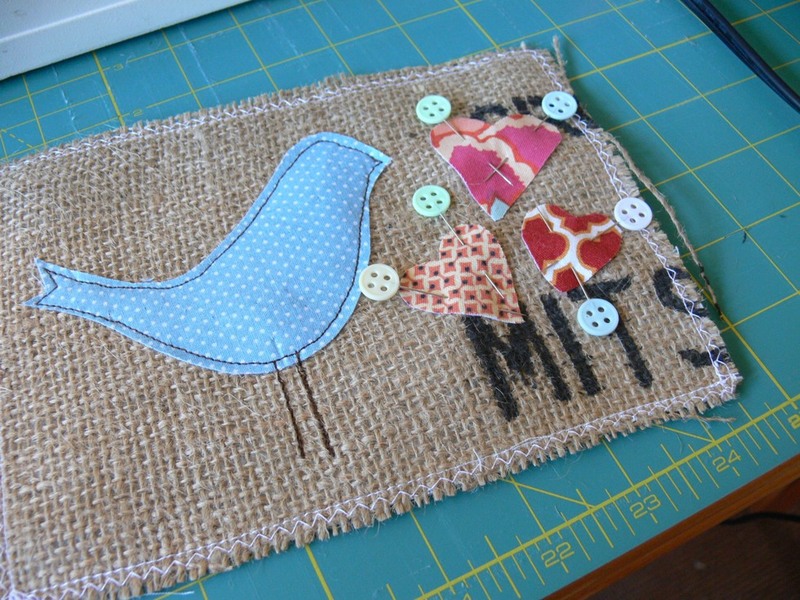 For this project, I picked one the 5 x 7 rectangles in my stash. 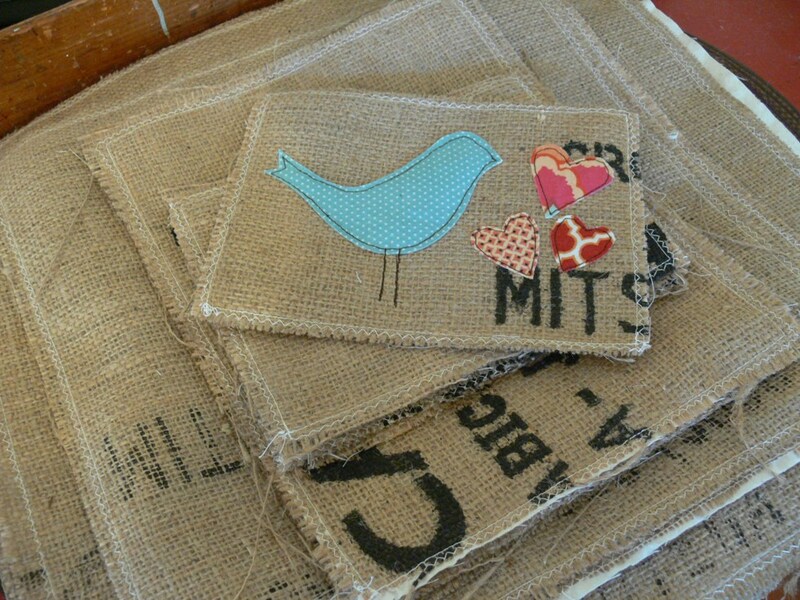 Since she liked the burlap art I had previously made, I chose not to veer too far off path and went with a birdie. I simply re-drew my little pattern into a smaller version. My thought -- and this feels really cheesy to write out -- is that it would be a little birdie who brings love to my friend, her husband and little boy in this challenging time in their lives. I went with a very simple heart shape in 3 different sizes and 3 different fabrics in coordinating orange and red colors. I tried framing it in the only 5 x 7 frame I could find in our house to see what it would look like, and I was less than thrilled with it. I am thinking it's probably the type of art that needs to be matted then framed to give some space between the fiber and the frame. What do you think? 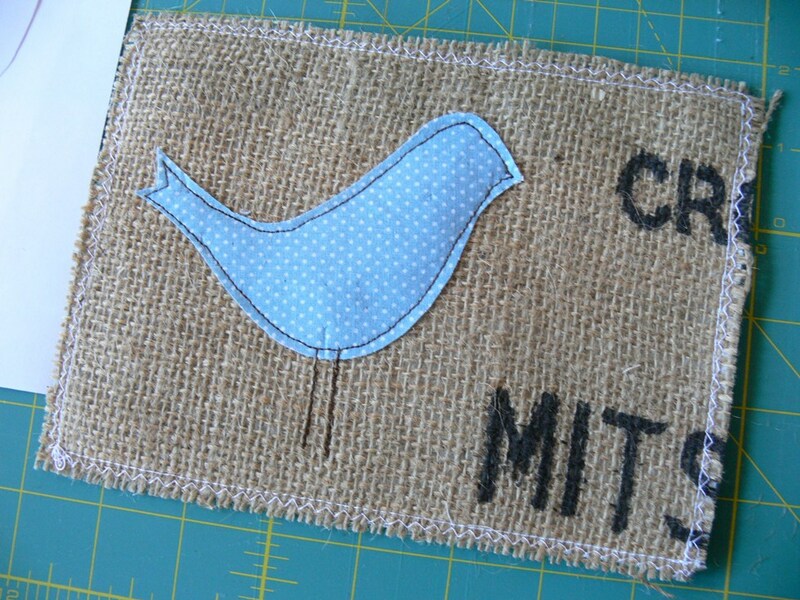 I have mixed feelings about it, it's not exactly matching my vision, and I also wonder if I should have used a piece of burlap with a less bold print. But, I do think it's pretty sweet and it was made with a whole lotta love. 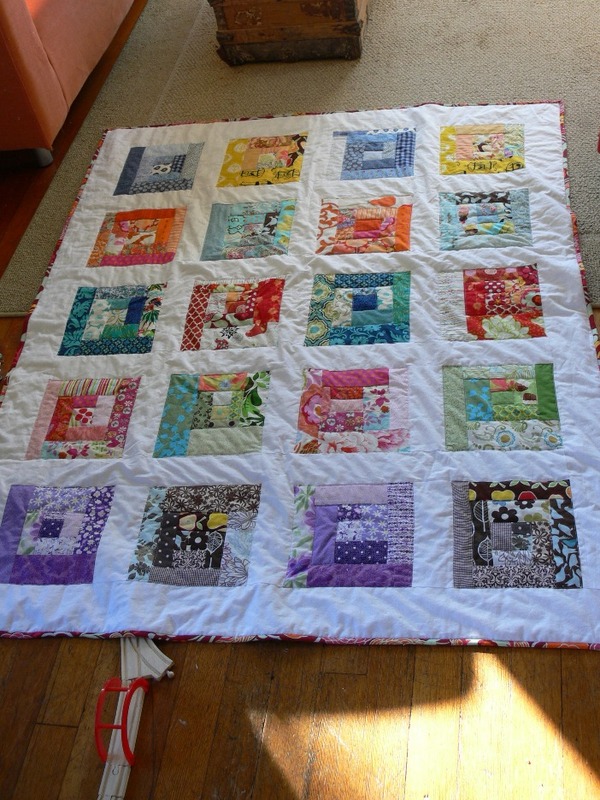 I am so nervous about giving it to her (and I am pretty sure she doesn't check the blog, so no worries about spilling the beans here!). I hope she likes it! I'll keep you and our readers posted about the progress of the Etsy shop. Do you think this is a type of small-scale artwork in which people would be interested?? 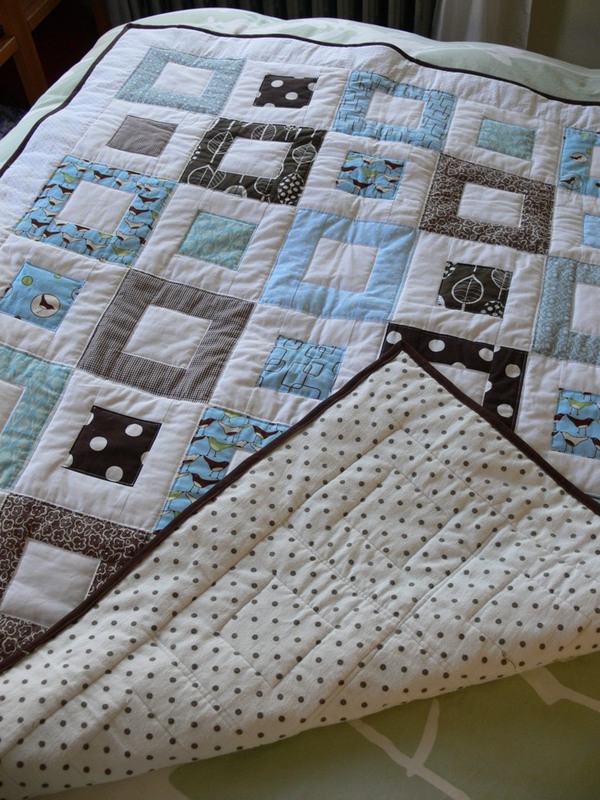 PS: Not that it excuses his ignoring my baby quilt in favor of his football game, but my hubby noticed this little project as soon as he got home from work, asking "Who's this for? This is nice!". Aw, totally made my day! 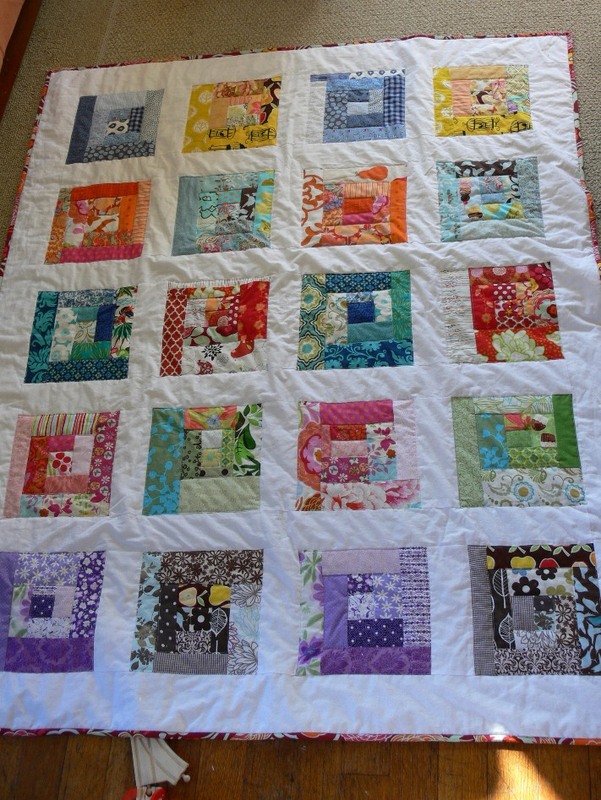 In my last post about this project, I had just completed my quilt top. Shortly after that, I added my border pieces. 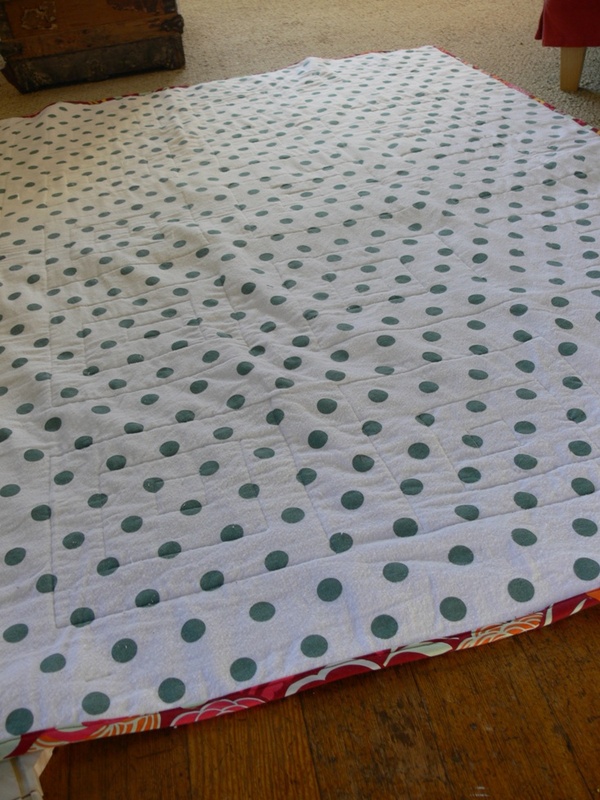 I don't necessarily think a border is essential on this type of pattern, but I had cut the fabric for it so I decided to sew it on. I think I goofed on the measurements somewhere in the process again, since some of the blocks on the edge look all uneven in width now. Oy. 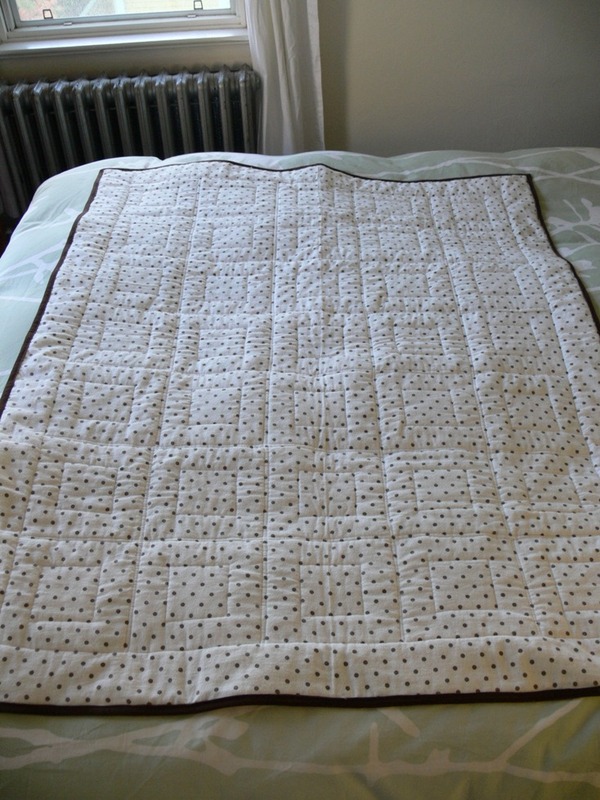 I put in a double layer of batting so this quilt would be warm and substantial enough to play on. 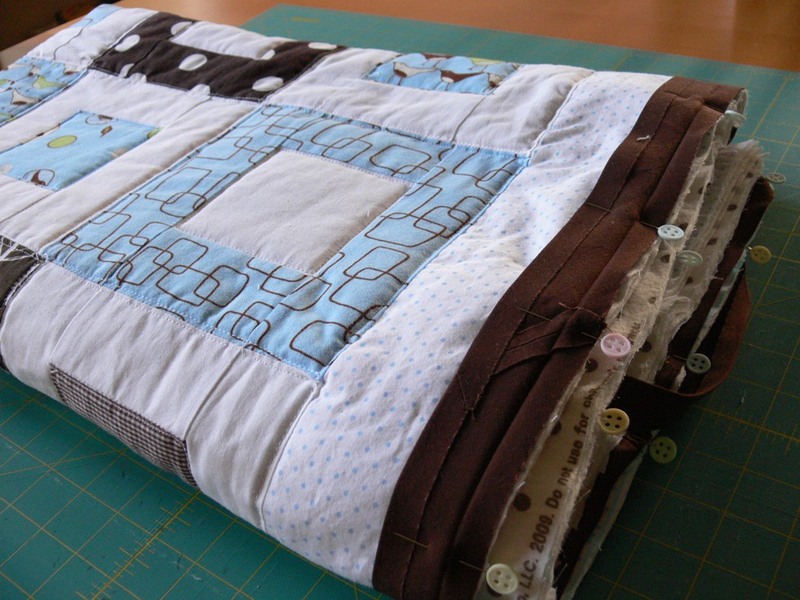 I backed it with that snuggly flannel, and pinned the whole thing together with safety pins. 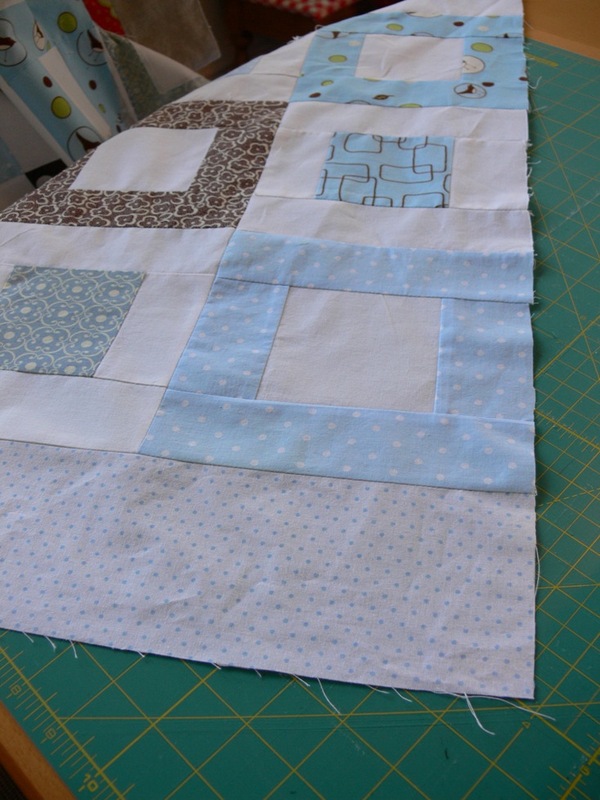 I quilted straight lines 1/8 inch along both sides of the seams between the squares, both horizontally and vertically. 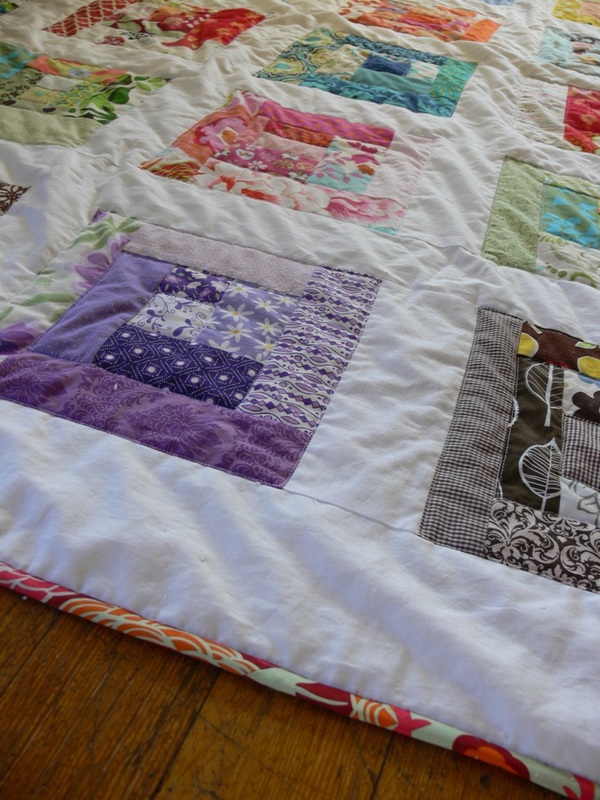 And I quilted 1/8 inch on the inside of the center squares, which was quite tedious. 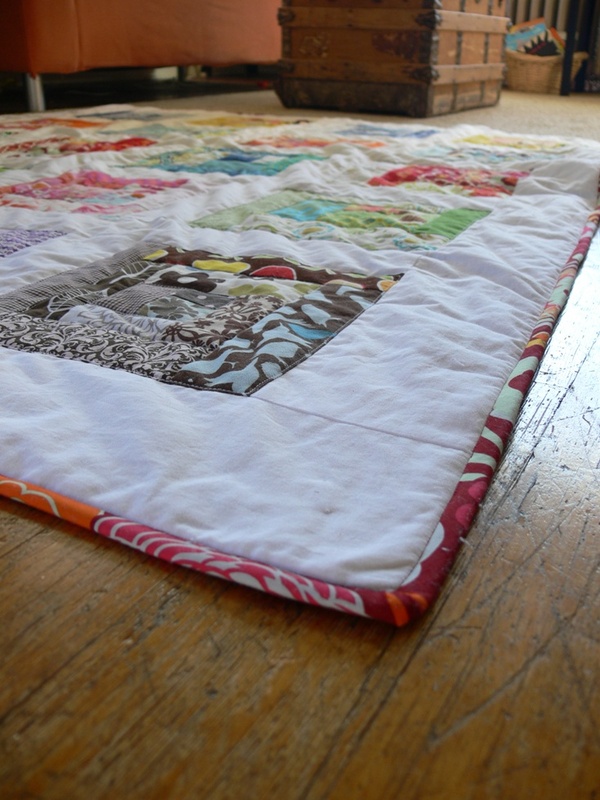 You can see the resulting grid on the back of the quilt, I like it! 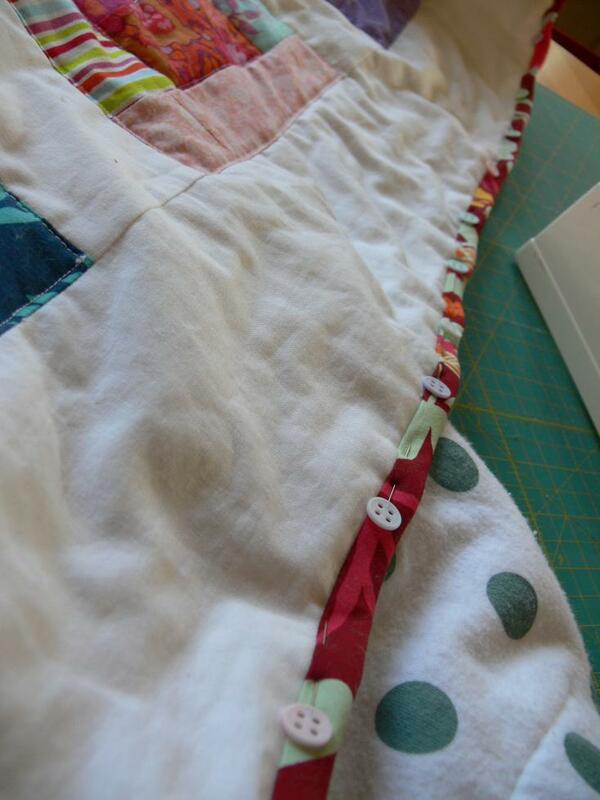 After I put the last stitch on that binding, I jubilantly exclaimed "I'm done! 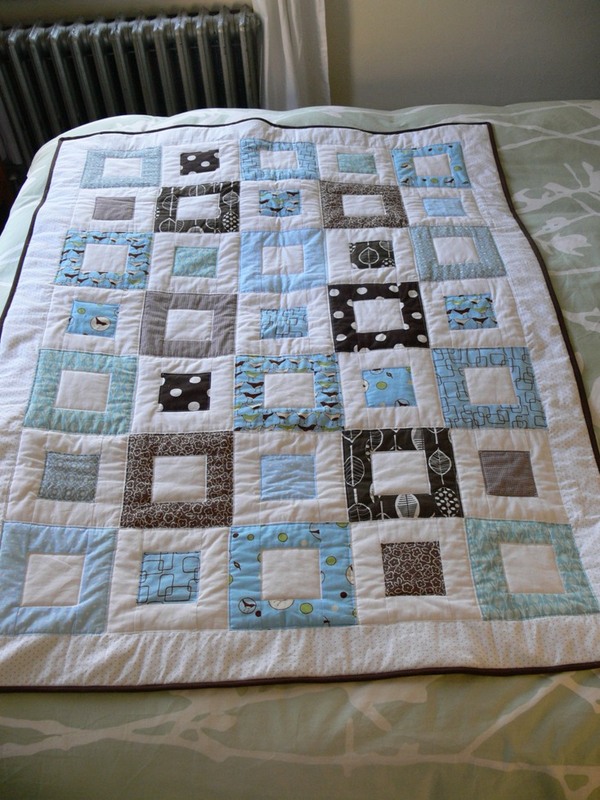 The baby quilt is done!". Only crickets in response, so I headed to the living room where I stood between my husband and his football game, holding up my precious project for him to admire. "What do you think?" I asked. "It's nice", he said. "It's very brown". Ah, men. Yay for finished objects! I'll bet it feels great to get this out of the way. 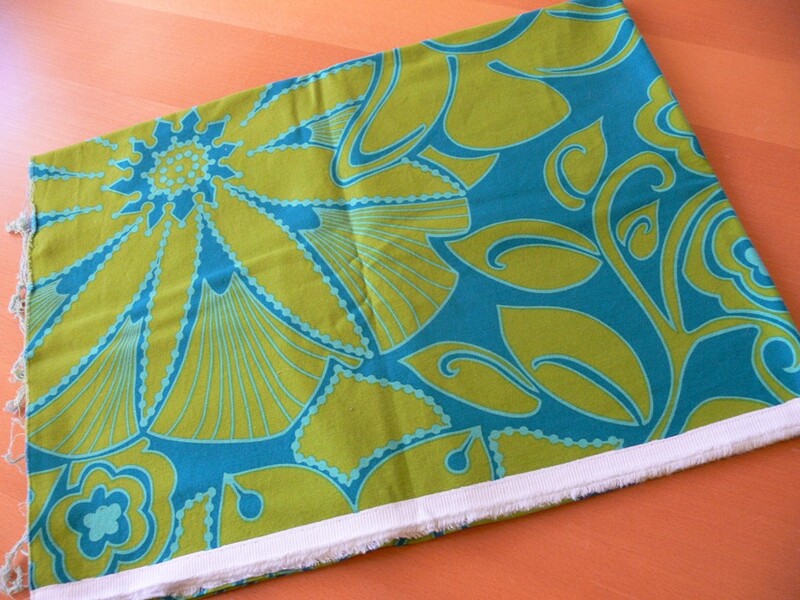 The colors and prints are so "you", and it is very cool that you also learned something new (when you sewed on the binding) along the way! Still working on the video sync issue, but I'll have a video message up for you this week!